Tender, flavourful organic venison steaks, reared on West Country farms and prepared in the Riverford butchery. For a special but ultra-quick meal, simply grill and serve with greens and your favourite potatoes (a gratin is always good). Venison’s richness goes well with many sauces: traditional red wine, sweet teriyaki or sherry-and-cream are all winners. Approximately 2 venison steaks per pack. 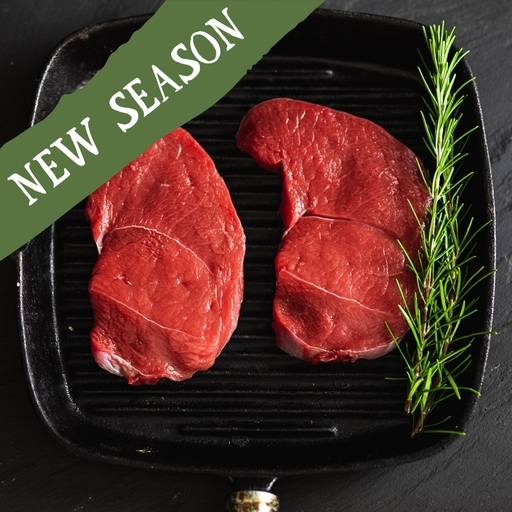 Our venison has a short season - we think that it will be available to buy until about the 16th of November depending on how fast it sells. Oil and season the steaks. Heat a frying or griddle pan until smoking hot. Fry the steaks for 1-2 mins each side, depending how rare you like them. Let them rest somewhere warm for 5 mins before serving. All our venison comes from small organic herds reared on Westcountry family farms in Looe and Exmoor. They graze a natural diet of clover-rich grass and wild flowers, roaming the land in natural rutting groups. The result is a tender and very healthy meat, with a milder, less gamey flavour than wild venison. Venison is a healthy meat; lower in fat than skinned chicken breast, higher in iron than any other red meat, low in cholesterol and brimming with Omega-3s.